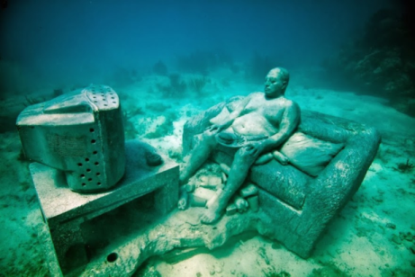 Diving into the ocean by the coast of Cancun, Mexico you can be astounded by numerous underwater sculptures. Sculptures of ordinary people like me and you. Set in the blue waters it seems they are making statements like a cry from the ocean. And that is exactly what artist Jason deCaires Taylor wants them to do. His art evolved from the land-art movement that started in the 1970’s. It addresses social issues, using materials that are close to the earth. Being environmentally aware, he tries to activate and raise awareness. The heart of Taylor’s work is his love for the ocean reef and the sea. Growing up in Malaysia Taylor dived into the ocean as a child and became a professional underwater photographer. Graduating from the London Institute of Arts with an honors degree in sculpting he combined his expertise with his love of diving and started to create beautiful underwater sculptures. Another sculpture that intrigues me is Inertia, a sculpture that seems to be a critical note to our modern-day consumerism. The definition of ‘inertia’ is ‘the resistance of any physical object to any change in its state of motion’. And that is exactly what we see: a half-dressed man sitting on a filthy couch staring at his television screen with a hamburger on his lap. He seems to have been sitting there for years, lost, even more so as he sits there all by himself in an endless ocean as if nobody even notices him. I gazed upon this sculpture for a long time and found myself getting into this existential mood where I wondered why we are on this planet in the first place. And that is exactly where Taylor wants us to be. Are we actively projecting a lifestyle that shows a deep love for our planet? And if not, why not? Do we realize the significant impact we have on our planet’s ecosystem and what the effect will be for future generations? If we do, where do we even start making some changes? God calls us to have dominion over this earth. God himself invites us to play an active role in nurturing our planet. He gives us a great responsibility being co-heirs with Christ. What legacy are we leaving behind? Taylor for one wants to leave a legacy behind. Using a special salt-resistant cement his sculptures will be able to last for over 300 years. This means that they will be able to be enjoyed by future generations. More than that, he also wants his sculptures to be new habitat for coral and a place of refuge for fish and other animals. 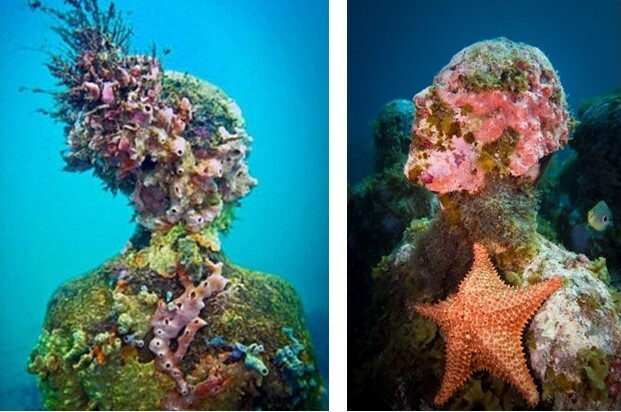 The results thus far are astonishing, as the reef is welcoming these sculptures with open arms. 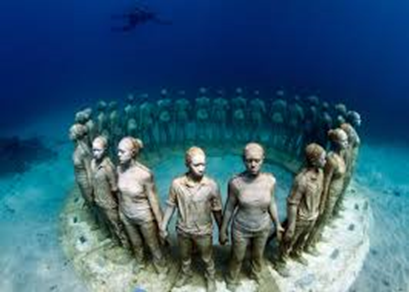 Jason deCaires Taylor: Vicissitudes, 2007, life-size figures, salt resistant cement. Jason deCaires Taylor: Inertia, 2007, life-size figure, salt resistant cement. Reida Officer is an art teacher at the Cibap Vakschool voor Verbeelding in Zwolle, the Netherlands. She graduated from the ArtEZ Art Academy in 2010 with a BA Fine Art and Design in Education.